Painting Acrylic on Art Card Paper | 11" x 8"
Painting Watercolor on Handmade Paper | 13" x 9"
Painting Acrylic on Canvas | 15" x 9"
For me, painting is not just making a verbatim copy of what nature spreads out all around. It is the ability to interpret what nature individually communicates with me. My love for travel has not just elevated my soul but it has also inspired my art to a very large extent. My fascination with historical places in India has opened up new avenues in my mind as well as my water colour paintings. I am trying to showcase the untold stories that hide in the recesses of pillars, monuments and ruins. I find peace in the simplicity of rustic and historic Indian landscapes and I would like my painting to make its audience feel awed and calm at the same time. Based from Nagpur and settled in hyderabad, Amit is a man of few words who lets his brush and palette do most of the talking. He holds a general diploma in art (Drawing and Painting) from Nagpur chirtakala Mahavidlaya, Maharashtra in the year 2004. He paints with various styles, mediums and techniques and adopts the best suitable feature to reproduce on paper as to what he sees in person. However, he does admit that his inherent passion for watercolours is what has led him to gain mastery over the medium. 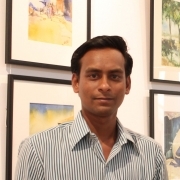 Amit has exhibited his paintings in many group shows .He has been awarded Best watercolour award in 2004 and 2013. Also participate Karnataka chitra kala parishath Art Mela and the other state also.